This is us on our 21st Anniversary trip – the weekend we met the murderer, and the weekend we saw the redemption of a parent’s worst nightmare. My husband Paul prides himself on choosing funky hotels to celebrate our anniversary. There was the “castle” in Maryland, the bed-and-breakfast on stilts, the World War II airplane hangar, the vintage farmhouse near Lukenbach, Texas. 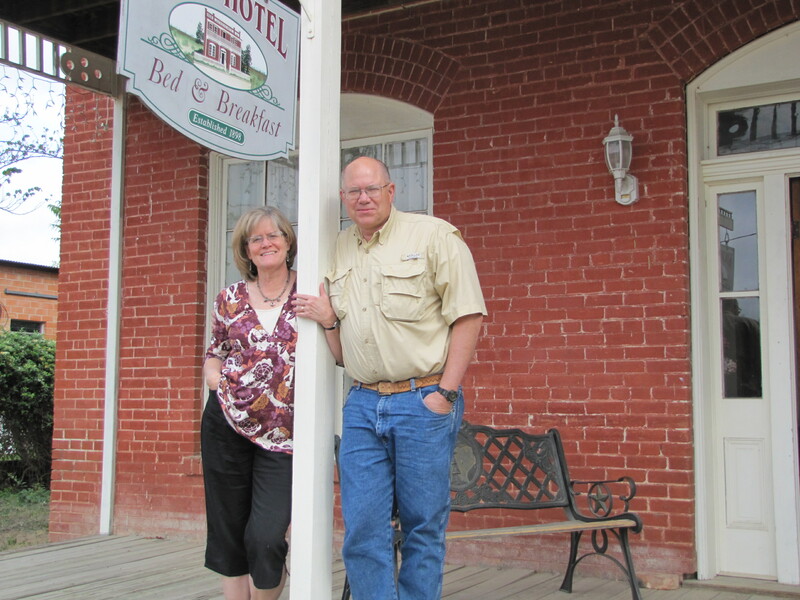 Hands down, the most memorable was this old railroad hotel in the flyspeck town of D’Hanis, Texas. The only other guest that weekend was a country lawyer – a portly West Texas version of Atticus Finch, in town to defend a killer. It was a warm night as we sat on the porch of the hotel while trains rattled by about 100 feet from the front door. “Atticus” introduced himself and told his tale. Seventeen years earlier, his client had been a foolish 30-something, running with a crowd of drug dealers and users. At a meet-up with suppliers on a ranch near the border with Mexico, things had gone terribly awry. Words were exchanged, guns were brandished, and two people were shot dead in a dispute over money owed. Their bodies were buried in a spot so barren no one ever passed there. Later the killers dug up the bodies and burned them. The cold case heated up again 15 years later with a tip from a jailhouse snitch. There was no doubt that Atticus’s client was among the guilty. Now, it was just a matter of sparing him from a life sentence. “What’s he like?” we wanted to know. Picture in your mind an aging drug dealer/killer, ravaged by years of hard living and keeping an unspeakable secret. Now erase that picture from your mind. Up to the porch that night stepped a fresh-faced, nattily dressed Texas cowboy, boots polished and Wranglers pressed to a fare-thee-well. With him was his wife, looking like a candidate for homemaker of the year. We shook hands and made small talk. As I looked into their eyes, I saw a shadow of dread, knowing that the life they had made together was about to come to an end. All I knew of that life was what Atticus had told me — that while the cold case grew colder the killer had become a model businessman, a father, a generous contributor to his small town, and to all outside appearances, a standup guy. Part of me wanted the judge and the families of the victims to forgive him, but that wasn’t possible. He was convicted and went to prison, as he should have. So why is this a story of redemption? Because it shows that anyone can change. Any broken life can be healed. I picture this man as a young adult being his parents’ worst nightmare. I imagine that he broke their hearts as they saw him slide into a life of drugs and violence. I don’t know if all those years they knew he was a killer. I don’t know if the murder was the tragic wake-up call for the family. Maybe his loved ones just saw the gradual climb out of moral squalor to normalcy and counted their blessings. This is not a perfect story with a happy ending. But it is a story of hope. The things our adult children do have consequences, and the price for their mistakes must be paid. Happily the price usually falls short of a prison sentence. Suffering consequences is a lesson we should never stop teaching them. But I learned other lessons that anniversary spent in D’Hanis, Texas. Young adults can be stupid. Drugs and greed can take their toll. Justice is hard. But no one is beyond redemption.